To view the images or references, you must click on the links in blue. Links in green are to journals with free full text-no registration. You can also access these cases by visiting our Home Page, then click on the Case of the Week button on the left hand side. This email is sent only to subscribers. To subscribe or unsubscribe, email NatPernick@Hotmail.com, indicating subscribe or unsubscribe to Pathology Case of the Week. There is no charge. We do not sell, share or use your email address for any other purpose. We also have free email subscriptions for Pathologist/PhD jobs (biweekly), Other laboratory jobs (biweekly), Pathology website news (monthly) and Pathology new books (monthly). Email us to subscribe. This 24 hour review and update in the areas of clinical chemistry, immunology, microbiology, and molecular medicine is intended to improve knowledge about the pathogenesis and clinical manifestations of a wide variety of metabolic, infectious, immunologic, and genetic disorders along with the selection, performance, and interpretation of clinical laboratory tests. Approximately 60% of the diagnoses in medicine are based on the results of laboratory testing. The 2nd Annual Winter Update program will address this major gap in knowledge and inform the participant about developments in clinical laboratory testing and their relevance to clinical medicine. 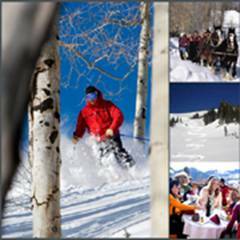 The conference is held at The Canyons in Park City, Utah. Click here for more information. How can you learn about new fellowship openings? We have a new email list sent out every two weeks, listing the new fellowships posted at our website. To subscribe, email NatPernick@Hotmail.com with subscribe to Path fellowships email in the subject line. We have started a new section on Board Review Questions. If you have sample questions and answers, just email them to us. Tell your colleagues about our Other Laboratory Jobs page, which includes jobs for PAs, cytotechs, med techs, histotechs, managers, etc., and now includes related corporate jobs, such as pathology related sales. If you are looking to fill a position, the cost for these ads is only $500 for 6 months. We thank Dr. Angela Bohlke, Tulane University Hospital, New Orleans, Louisiana (USA) for contributing this case. 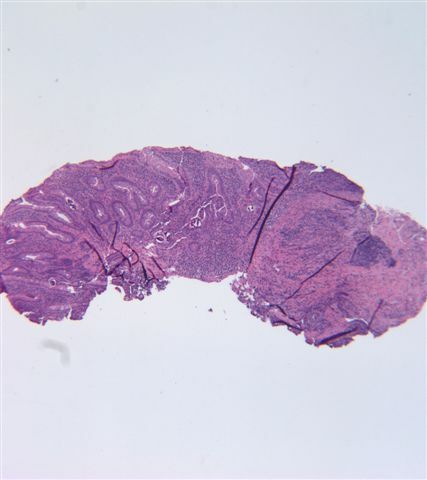 To contribute a Case of the Week, email NatPernick@Hotmail.com with the clinical history, your diagnosis and diagnostic microscopic images in JPG, GIF or TIFF format (send as attachments, we will shrink if necessary). Please include any other images (gross, immunostains, etc.) that may be helpful or interesting. We will write the discussion (unless you want to), list you as the contributor, and send you $35 (US dollars) by check or PayPal for your time after we send out the case. Please only send cases with high quality images and a diagnosis that is somewhat unusual (or a case with unusual features). 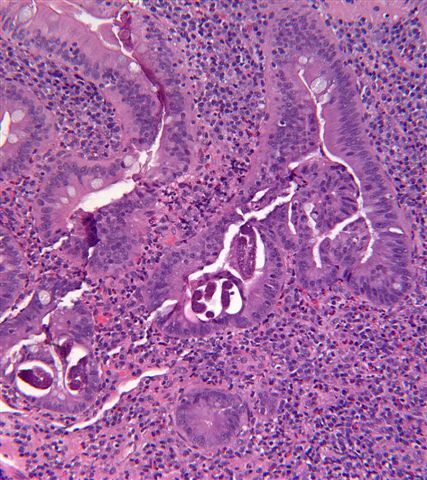 A 43 year-old Honduran man presented with diarrhea and abdominal pain for one month. Physical findings and endoscopy were unremarkable. Duodenal biopsies were obtained. Subsequent stool findings showed Strongyloides ova. Strongyloides is a nematode whose larvae buries into the mucosa of the duodenum and jejunum, where they mature into adults. The females then lay eggs, which develop into larvae that pass into the stool, where they mature and become infective. The infective larvae penetrate intact skin, usually through the feet. The larvae enter the circulatory system, are transported to the lungs, and enter the alveolar spaces. They then are carried to the trachea and pharynx, are swallowed, and enter the intestinal tract, where the process is repeated. If the larvae become infective before leaving the body, they may invade the intestinal mucosa or perianal skin, causing autoinfection (see life cycle). Most patients suffer diarrhea, malabsorption or no symptoms. Immunocompromised individuals can acquire disseminated strongyloidiasis, a possibly fatal condition in which worms move into other organs (WormBook 2007 May 23:1). Diagnosis is by stool exam, looking for larvae, or by biopsy of small intestinal mucosa, looking for the adult female or eggs. There is often granulomatous or eosinophilic inflammation. 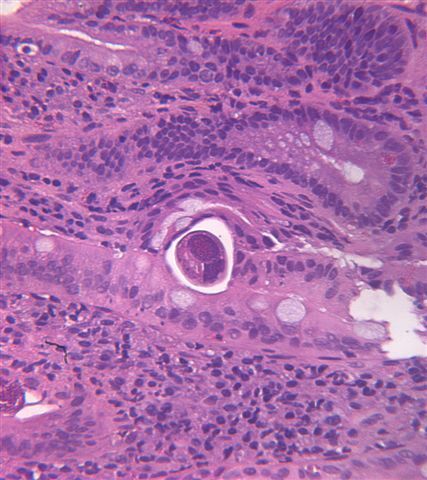 In female worms, the intestine or ovaries may be prominent (image). In gravid females, an egg (green arrow) may be identified within the uterus . Treatment is with antihelminths, such as thiabendazole (Ann Pharmacother 2007;41:1992). Prevention is by wearing shoes in endemic areas.